MUKILTEO, WA – Puget Sound maritime lore from the 20th Century is thick with shipping, fishing, cedar milling and early ferry traffic, not to mention rich native history and occasional recreation. The waters were sometimes dangerous and unpredictable. Operating bright beacons, our lighthouse keepers kept ships from running aground along the rugged shorelines. The brew crew at Diamond Knot wanted to recognize the Mukilteo light station keepers who aided in navigation after the station’s opening back in 1906, and thus created The Keeper’s Series, a collection of big, bold, cellar-able ales hearty enough for any soul, but limited enough just for the lucky few who can get bottles from the less than 300 cases to be released. The first release in the series is The Keeper’s Old Ale. Brewed using six different malts and barley; this beer has a lot of depth. It’s full-bodied and rich. Flavors of sweet plum, dark sugar, and raisin relax into a warm molasses finish. The character develops with time. We recommend storing Keeper’s bottles upright in a cool dry location with minimal light. Extended cellaring is also encouraged but not required for enjoyment. The Series is bottled in 500ml Belgian-style bottles, complete with original artwork by Whidbey Island artist David Gignac, best known for his glass and metal sculptures and his edgy, dark drawings. The Old Ale finished with a 9.9% ABV and 45 IBUs. The Keeper’s Old Ale will be released February 8 at specialty bottle shops, ale houses and larger beverage retailers. With plenty of time to get into the spirit of St. Paddy’s day, Diamond Knot will release its early spring favorite: Slane’s Irish Style Red Ale, on February 1. In its 21st year, Slane’s gives a nod to DK’s co-founder’s granddad, who brewed for Pabst back in the day. This ale has a sweet, caramel aroma with a very tiny hint of toasty smokiness, imparted by the chocolate malt. Loads of caramel malt give this beer a beautiful red hue. Munich malt and flaked barley make for a big, malty full-bodied middle which drops off into a dry, crisp finish. 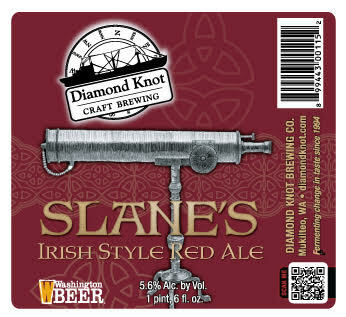 Slane’s Irish-Style Red Ale rings in at 5.6% ABV and 30 IBUs, and is available on draught, as well as in 22oz. bottles. Wildly successful, production is increased every year, and every year Slane’s sells out, leaving the brewers anxious for the next Slane’s brew day in December. For more information on Diamond Knot Craft Brewing’s beer, head to diamondknot.com/the-beer. 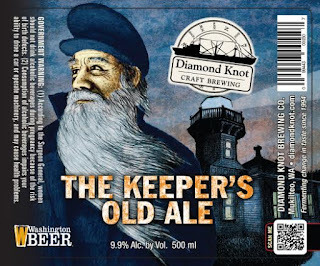 Founded in 1994, Diamond Knot Craft Brewing is a privately held company and Snohomish County’s oldest continuously-operating, independently-owned brewery. Handcrafted Diamond Knot ales can be found in 12 states, Japan and soon Korea, both in bottles and on draft. Additionally, Diamond Knot operates three production breweries and two full-service restaurants in Washington; the Brewery & Alehouse in Mukilteo and the Brewpub @ MLT in Mountlake Terrace. Diamond Knot prides itself in providing exceptional craft beer, food and lively experiences, as well as being charitable members of the communities in which it operates.